Schematic view of an array of integrated single photon sources which are resonantly excited by electrically driven microlasers. In this project we will develop integrated sources of single and entangled photon pairs for applications in the field quantum communcation. 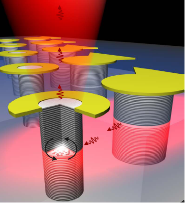 Within an on-chip approach electrically pumped whispering gallery mode microlasers will resonantly excite single quantum dots embedded in adjacent micropillar cavities and Bragg-reflection waveguides. By this we will a new level of integration without the need of external light sources. Besides technological challenges, there exist a number of exciting physical questions such as an in-depth understanding of the non-linear processes involved in the generation of entangled photon pairs which will be tackled by our project. Our work will set the ground for a quantum optics platform that could revolutionize the way we conduct quantum optics experiments and may in the long run become a new quantum technology. APL Editor's Pick by Shanhui Fan (week of Feb 28 2016).